Halloween is great, in part, because it makes very little sense in so many ways, and, as traditions get updated over the years, it only seems to make less sense. 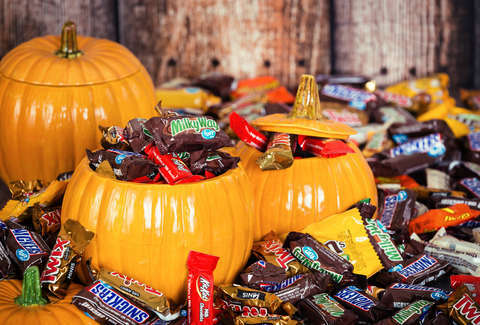 As a country, the United States will spend $9 billion on Halloween, according to the National Retail Federation. The bulk of that will be spent on candy. Candystore.com pulled together 11 years worth of candy sales data to determine the most popular Halloween candy in every state to help contextualize the absolutely silly amount of bite-sized candy that will be purchased in October. Many states retained their favorites from last year, while others, like California, changed things up by buying 1.6 million pounds of Skittles. The state was one of five that had Skittles at the top of the list, helping it to become the most purchased candy in the country, per Candystore.com. Only eight states came out of the study with a candy that no other state claimed. Those states were Connecticut (Almond Joy), Delaware (Life Savers), Illinois (Kit Kat), Kentucky (Swedish Fish), Louisiana (Lemonheads), Mississippi (3 Musketeers), Wisconsin (Butterfinger), and West Virginia (Blow Pops). The data was pulled from the store's own candy sales from 2007-2017 in the months leading up to Halloween. Additionally, the report says, the company has "relationships with major candy manufacturers and distributors — all of whom contributed and helped us verify our conclusions."